I don’t have any book reviews to share this week. I’ve been having trouble concentrating on reading when I’ve been so addicted to watching Scandal! (I’m all caught up now – expect a full post on my love for the show next week!) So instead of my usual weekly report on what I’ve been reading, today I just have the Literary Junkies Link Up, which I always enjoy participating in! 1) What are you currently reading? Tell us about it! The Seduction of Miriam Cross by WA Tyson – I will be reviewing this in 2 weeks for TLC Book Tours! 2) How many books have you read this year? Do you set reading goals for yourself? I read 59 books in the year between my last birthday and this one. I had a goal of 25 books so I pretty much crushed that goal! 3) What do you think are the best and worst book-to-movie/TV show adaptations? I don’t have a best really. One that was not very good for me was My Sister’s Keeper due to a major change made from the book to the movie! 4) What is the first line of your favorite book? “It’s hard being left behind.” – Clare in The Time Traveler’s Wife. Craftsy classes are designed to have all the benefits of an in-person class, with none of the drawbacks. Available online and on-demand, you always have world-class instructors at the tip of your fingers. You can retake the class as many times as you want, and the 30-second repeat feature allows you to watch the same section over and over again until you get every technique just right. 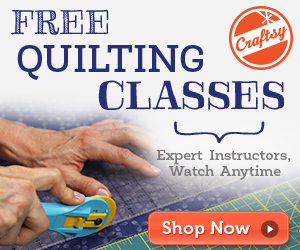 Watching a Craftsy class is like having a first-row seat with some of the best instructors in the world. Even better, classes have a 100% money-back guarantee.